Despite collapsing into clumsiness near the finale, Spectre’s James Bond dovetails in a perfect combination of Craig-era romantic irony and classic 007 cool. Daniel Craig may not ever have a lot of plot to work with, but he’s crafted a nuanced James Bond who’s evolved from the violent meat-weapon of Casino Royale to the smug, distant, romantic Bond in Spectre. That he does so in a standoffish, almost thuggish way speaks volumes to his melding of damaged lover and aloof assassin. From the opening moments, we realize Bond has regressed even further into himself since Skyfall: suave as ever, but with his panache directed towards the efficient completion of his mission, not a one-night stand. The opening sequence is a doozy. Director Sam Mendes and director of photography Hoyte Van Hoytema (Her, Interstellar) follow an extended tracking shot (that ends with Bond strutting atop a parapet like a runway) with a combination of ’70s noir, throwback Bond setpieces, and modern Wes Anderson-style centered symmetry. This is a very pretty 007, with the opening titles possessing a Girl with the Dragon Tattoo-level of black, dripping, dangerous sexuality. Colors flip between the cold blues of London and the rustic browns and oranges of Rome and Africa, while each frame is composed with such care that even the uninitiated or unobservant can identify the intended focal point and manage to ascertain some deeper meaning. As Bond attempts to investigate and thwart a scheme somehow involving the surveillance state and his own tragic backstory (the plot is drivel), he stumbles into enough car chases, train fights, and building demolitions to excite the most jaded action fan. Car chases look like violent commercials, all impossible gliding turns and glossy exteriors. Luckily, humor is routinely injected into the action to compensate for its partial delves into intangibility. This may be Craig’s lightest Bond yet, in terms of cheeky winks and visual gags. Dave Bautista (Guardians of the Galaxy) helps those along as a perfectly overwhelming henchman, bulldozing his way through obstacles, scenery, and Bond himself with the showmanship garnered through a career of pro wrestling. And where would 007 be without a new Bond girl? This iteration’s offering, Léa Seydoux (The Grand Budapest Hotel, Inglorious Basterds) as Madeleine, slays as a counter to Bond. Equally funny, sultry, and poignant, Seydoux counters Craig’s hardened casing with a delicate veneer of her own. She and Eva Green will go down as two of the best. For all the cheek Spectre gives you, as soon as it turns to the plot, it immediately becomes broadly no-nonsense and jumbled. If you meshed all the Mission: Impossible plots into the newer Fast & Furious storylines, you’d have an approximation of why following along with Spectre’s plot is pointless. Andrew Scott rehashes his Moriarty performance from BBC’s Sherlock into the head of the merger between Britain’s intelligence forces. Pompousness is a good look for Scott, but his monologuing gets old quickly, especially when we know we’re not watching the secret agent do something much, much cooler. The final third of the film, as soon as they disembark from the aforementioned train, becomes a fan-made Austin Powers parody. For all the self-seriousness of the surveillance politicking, its culmination feebly echoes the dangerous utilitarianism of Watchmen and our own NSA. The superficial commentary can be boiled down to the opposing sides of the argument: invasion of privacy vs. preemptive prevention. That’s as far as we get. But juxtaposed with Christoph Waltz’s maniacal performance as the main villain, the limply relevant plot surrounding and supposedly supporting his character feels completely insufficient. Not to mention his beef towards Bond seems totally foreign to the generically convoluted logic of the rest of the plot. We go from point A to point B and suddenly Waltz has tied us to some railroad tracks, twirling his mustache and cackling. The romantic developments inside Waltz’s evil lair come fast and unmotivated, finishing with a literally handheld escape that looks as goofy as Mike Myers in a frilly shirt stopping to pick off a few henchmen with a pistol as the building explodes around him. After those zany theatrics, the main plot must be resolved in the lamest, easiest, least dramatic way possible. Bond runs through an on-the-nose metaphor for aging while M and the rest of the crew hack a computer. Yes, this is basically the same final act as Furious 7. And yes, Furious 7 does it much, much better. Which is saying something. I walked out of Spectre thinking one thing: I should buy a black turtleneck. When you walk out of a James Bond movie thinking that, you know it’s done something right. 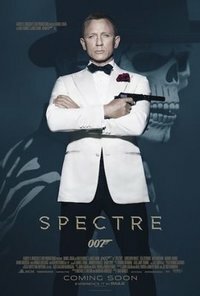 For as much as this movie tries to make being a professional killer seem like a painful, distancing, lonesome profession, Spectre and Daniel Craig succeed in bringing Bond back to basics. And that means it nurses your inclination to covet. Not necessarily the gadgets or the cars or the ability to take a life, but the confidence that goes along with them – or walking away from them. Martinis shaken, widows of your enemies seduced, supervisors cheekily chastised, and girls gotten, Craig’s Bond reaches peak 007 in his own unique way. From brutal, brooding warrior to a man hiding passion behind a blank facade. Bond movies are never about the plot, they’re about the Bond. Spectre finally sees its star join the ranks of classic 007s by spitting in the face of the series’s misanthropy and misogyny with the emotional indemnity of a romantic hero. Spectre sets you up with the conventional coolness of James Bond, complete with a fanatic’s plethora of homages, only so you have a reference for exactly how much Bond is willing to sacrifice for love. For all the chases and fights, Bond really just has some romantic and psycho-sexual issues to work through, and the best thing about Spectre is that it allows this Bond to unfold before us in the context of a conventional action movie. Even if it’s not perfect, the fact that the ride we go on with this Bond is almost as cheeky and self-assured as its star is consolation enough.